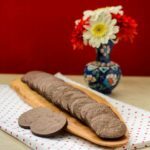 A recipe for chocolate brownie wafer cookies. The cookies are thin and crunchy with a deep chocolate flavor and texture reminiscent of a brownie. Add the flour to a medium bowl. Sift in the cocoa powder. Whisk to thoroughly combine. In a large bowl using a hand mixer on high speed, cream together the sugar and butter. Add the salt, egg, water, and vanilla to the creamed mixture. Beat on medium speed until smooth and thoroughly combined. Add the dry ingredients and beat until just combined. Do not over mix. It will be a stiff dough. Divide the dough in half. On a worksurface lightly dusted with cocoa powder, shape and roll each half into a log about 2 inches in diameter. Wrap each log in parchment paper and freeze for 8 hours or overnight. (Dough can be kept frozen for up to 2 weeks). Preheat the oven to 325 degrees F. Line baking sheets with a non-stick liner or parchment paper. Unwrap 1 log and cut into 1/8-inch thick rounds. Space 1/2-inch apart on the baking sheets. Place the baking sheets with the dough rounds in the refrigerator for 30 minutes. Re-wrap and place dough in freezer between batches. Bake the cookies for 16 minutes. Check the cookies at 15 minutes for the first sign of the edges darkening. These cookies burn or scorch easily. Remove the cookies immediately from the baking sheet and cool completely on a wire rack. Check the bottom of the cookies after each batch. If too dark or burned reduce the amount of baking time. Completely cool the baking sheets before using again for the next batch of cookies. Refrigerate them if necessary. *Time above does not include time for freezing the dough for 8 hours or overnight.